Welcome to the latest update on War of Conquest! I’ve been hard at work for the last few months getting WoC to a state of being “code-complete”, where all the features are in place and it’s just testing, debugging and game balance (as well as additional art) that remain to be done. A context sensitive tutorial system that guides the player through the early stages of the game, introducing them to the major concepts along the way. I think one problem with the original WoC was that many new players found the learning curve too steep, and gave up before they figured it out. This should help solve that. A “patron” system to help encourage players to recruit their friends, similar to the affiliate system in the original WoC, but using in-game rewards. Basically, a “patron” gains a fraction of the XP and credits earned by each of their “followers” (recruits), and the followers also gain a fraction of XP and credits earned by their patron. A brand new nation rebirth system (I’ll cover this in more detail in a future update). Nation customization options — you’ll be able to not only change the color of your nation, but also add an emblem or pattern that gives your nation’s land a distinctive look. The map panel, revamped with a much improved system of map flags. Shown here is the first look at the new War of Conquest game world. 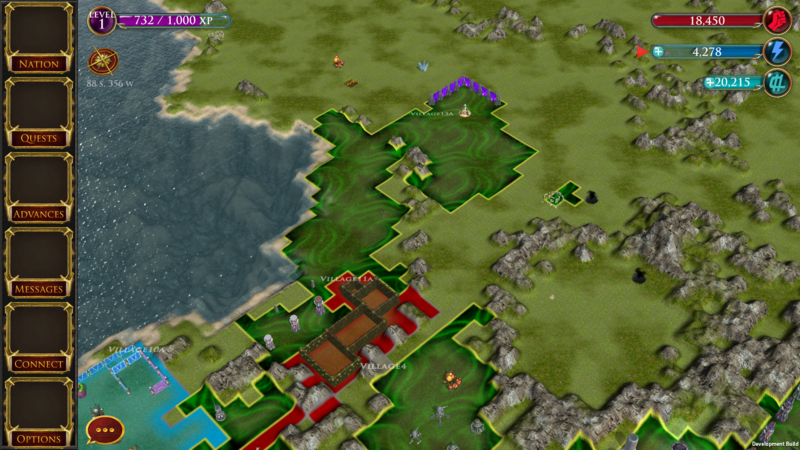 This is the world we’ll be using for alpha and beta testing. Once the game is finally released to the public, we’ll likely need to expand the world further. I’ve made sure that it’s much easier than it was with the original WoC to change the size of the game world, and generate entirely new maps. This will make it possible to adjust the world size as the number of players grows, and to give each game server its own fresh and unique map. While the Map Panel in the original WoC laid out every bit of the world in great detail, in the new WoC I’m looking to maintain a sense of mystery, to make exploration and discovery more fun. 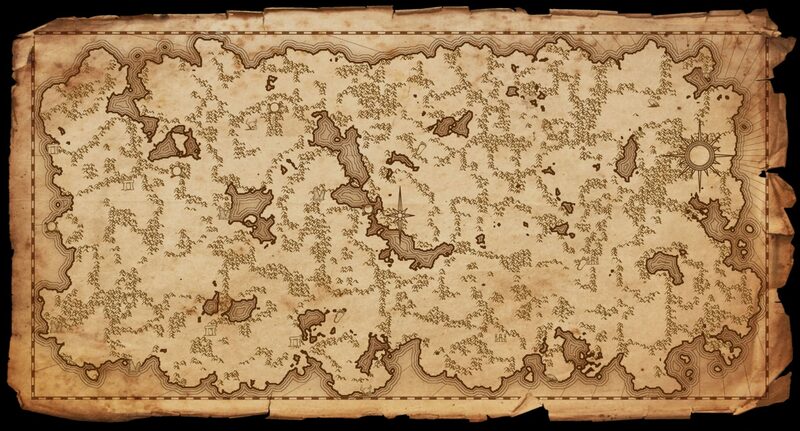 That’s why the new map looks like a weathered old artifact, passed down over many generations. There are only hints of what may be found in different areas of the world, and it’s up to the players to search out more revelations. The next step for me is to focus on the Kickstarter campaign. I’ll be writing and recording the Kickstarter video soon — if you played the original WoC, let me know what aspects of the game set it apart and made it fun for you, so I can make sure to mention these in the video! A few more development update photos: in the second photo, we see an energy storage device called an Earth Chakra, along with some high level fortifications (walls) called Void Dams. The third photo shows the same area of the world zoomed out; here you can see an example of a nation’s custom “skin”, in this case a swirling liquid-y pattern. 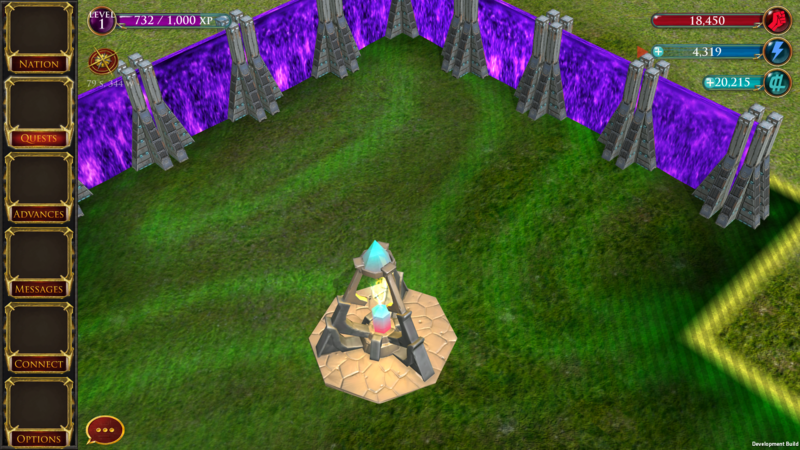 You can also see a few other defensive structures from a distance. 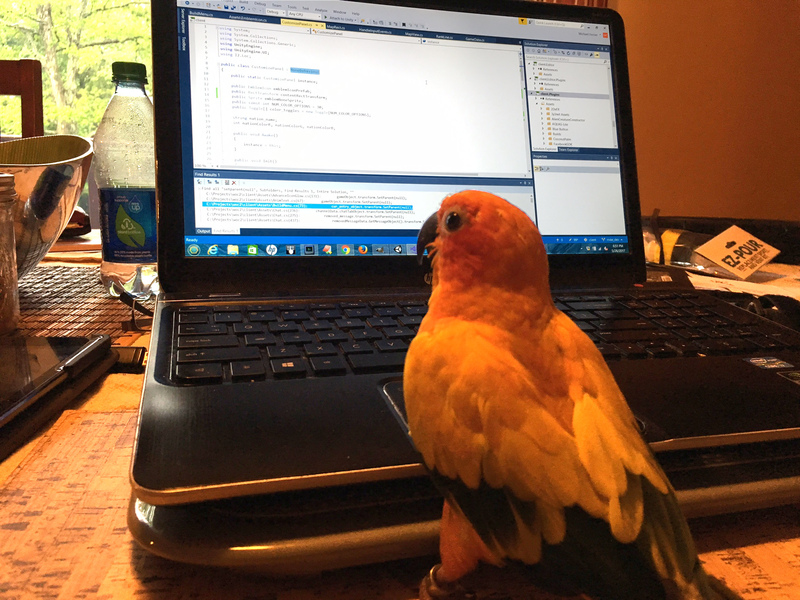 Finally, here at IronZog we take pride in having a diverse workforce; in the last photo you can see our parrot, Juno, hard at work coding the nation customization system. That’s all for now, further updates coming soon as the Kickstarter campaign approaches!